Description for Expressive Music (demo) publisher profile. This publisher and licensing store is only for testing and demonstration of our Live Demo account. This demo store features the LQ Standard (default) licensing profile, license types, descriptions and pricing calculator. For demo purposes, a Midi file and Sheet Music (PDF) license items have also been set up as a download purchase. 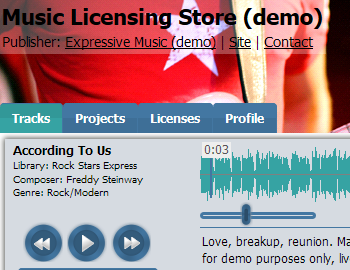 The "request clearance, price quotes and negotiate on-line" option is disabled because this is only a demo store (with dummy songs) for which no real license negotiations will be made.